Guillermo Guarnizo of project partner UC3M has provided an update illustrating the work progressing between February and November 2018 under WP2. After the completion of the A2.3.1 survey (November 2017), UC3M has focused attention on activity A2.3.3* related to FTIR spectroscopic techniques and primarily on the development of retrieval algorithms for identification and quantification of air pollutants. The definition of the three reference gas mixtures prepared by CEM to be used in further A2.3.5* has been carried out by all task partners (VSL, CEM & UC3M). We have discussed the possible gas mixtures to be used in the project, out of an extensive list of species candidates. Finally, the target gas mixtures which will be measured for validation activities have been defined, namely: Methane (CH4), Nitrous oxide (N2O) and Propane (C3H8). Concerning the experimental part at laboratory, the measurement procedure is based on a hyperspectral imaging system that works on the MIR range (1850 – 6667 cm-1), with a maximum spectral resolution of 0.25 cm-1. In our case, the measurements in absorption mode have a straightforward setup, which is illustrated in the next figure. 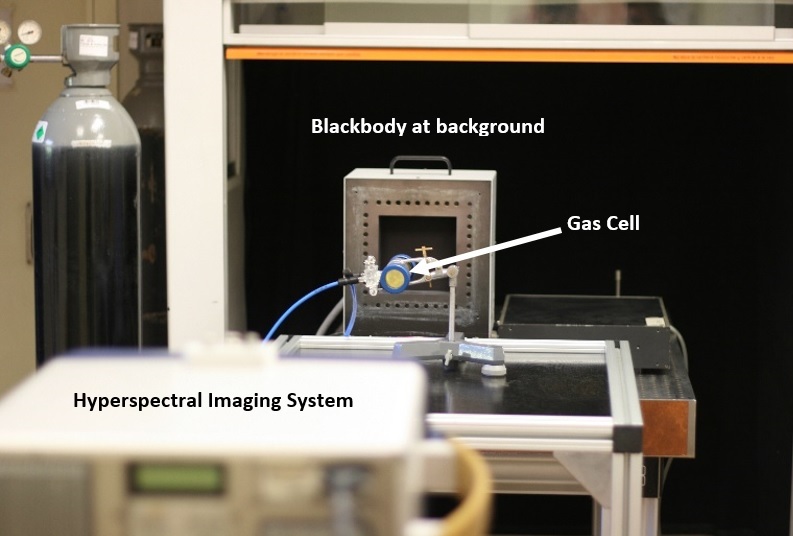 A preliminary test using CO2 gas mixture inside a gas cell was performed at low resolution. The next steps will aim at making transmittance measurements with the same setup and gas but at high resolution, applying the retrieval algorithms for identification and quantification (in ppm.m), and to evaluate its results before measuring the target gas mixtures of A2.3.5*. For further information, please visit our WP2 page. A2.3.3: UC3M will perform an analysis of FTIR spectroscopy techniques and will obtain new retrieval algorithms for simultaneous identification and quantification of combustion species. A2.3.4: CEM will prepare at least three reference gas mixtures which will be used for the validation activities of hyperspectral techniques.